Results from Colorado’s 2017 annual statewide education assessment, the Colorado Measures of Academic Success (CMAS), are in. The assessment, which Colorado has administered for three years, measures students’ academic proficiency and growth in grades three through eight. Students in grades nine through eleven take the college-aligned Pre-SAT and SAT exams. Colorado Succeeds has reviewed the results and, while there are there are outcomes to be proud of, the reality is Colorado is far from where it needs to be. 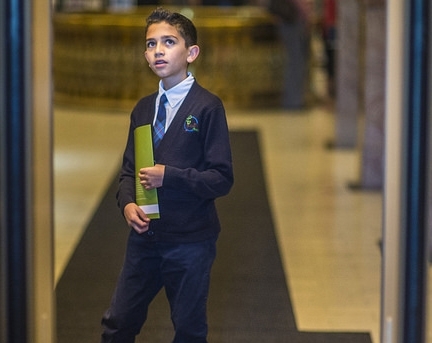 Colorado’s Hispanic and Black students, as well as those living in poverty and learning English as a second language, continue to be woefully underserved. As business and civic leaders, it is our job to confront these inequities head on and have the difficult conversations that will ultimately lead to real change. Access to high-quality educational experiences is something every child, regardless of race, economic circumstances, or previous academic achievement deserves and it’s an imperative for the future of the state. 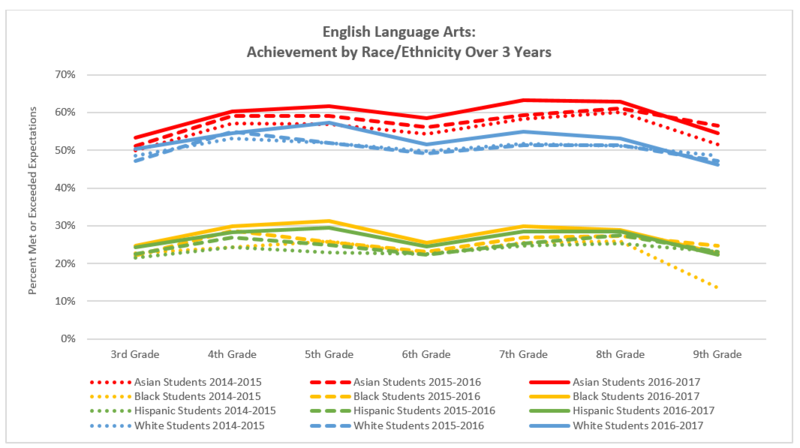 Persistent and Stark Achievement Gaps Among Student Groups: On average, Colorado Hispanic and Black students continue to perform and grow at much lower levels compared to their White and Asian peers. This is true across grade levels and content areas. While achievement by all student groups has fluctuated the last three years, large gaps persist and Colorado currently has the second largest achievement gap in the country. *Not all data available for 2014-2015 assessments (see line segment ending points). Stark achievement gaps also exist between the state’s low-income and non-low-income students. While improvements in achievement can be seen by both low-income and non-low-income students, the gap between the two groups has remained consistently between 25 and 30 points, depending on grade level. The good news is that some schools and districts are reversing this trend, posting impressive results for traditionally underserved students. University Prep Steele Street in Denver is one example. 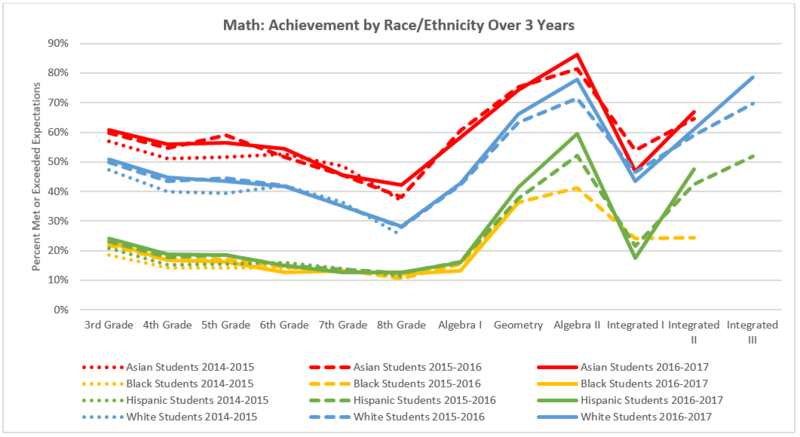 This high-poverty and 96 percent ethnic minority turnaround school had the most academic growth in the state for math. University Prep also had the eight-highest growth on state English tests. Long Fellow Elementary in Salida, a largely rural mountain community, is second in the state for most academic growth in math. South Routt RE 3 and Lake County R-1, both small, rural school districts, are within the top 10 districts for academic growth in both English and math. Colorado Succeeds’ business coalition is committed to creating a high-performing school system that combines quality and equity. This means the system must be fair and inclusive in providing access to quality educational experiences for all students. As our state’s population becomes more diverse, this work is of the utmost importance. Colorado’s fastest growing student populations are historically those who have been underserved by the education system. This should concern all of us, as the long-term implications of these grave disparities in educational outcomes threaten the vibrancy of our economy and the quality of life in our communities. Shutting the door of opportunity on a significant and growing number of Colorado’s youth will result in a large, disenfranchised, and under-skilled workforce. It will require Colorado businesses to rely even more heavily on importing qualified workers or be forced to locate elsewhere. That’s not a Colorado that we envision for our future, and it requires all of us to act. We believe the business community has an economic and moral imperative to focus Colorado leaders on closing achievement gaps. 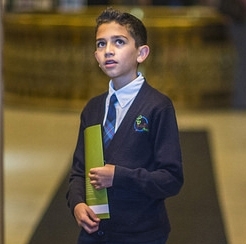 We want all students to grow and reach their full potential. We understand that different students require different resources and supports to provide that level of access. We maintain the same desired finish line for all students, but we understand that some students are running a sprint and some are running a marathon. We must intentionally invest in the students and communities who have been left behind by the status quo. This is imperative if we want our state, our economy, and our community to reach its full potential. We need all hands on deck. What can be done to tackle such large, looming challenges? At the very least, the business community must discuss the inequities of our education system. We cannot address disparities across racial or economic groups if do not talk about them explicitly. The good news is that businesses are already engaging in these challenging conversations, are leading with anti-discrimination policies, and are promoting diversity and inclusivity in their workplaces. Business leaders can share their experience to support further diversity in our talent pipeline and help create environments where students of all backgrounds are valued and pushed to excel. Yet, we cannot have these conversations, let alone begin to address the challenges, if we don’t have quality information about where the problems lie. As business leaders, we know that data is one of our most important tools when making decisions about where to put additional resources or highlight what’s working. However, much of the data we need to engage in this work is missing. Our partners at A Plus Colorado estimate that as much as 70% of the district and school level data for economically disadvantaged students was masked in the latest data release. This is called “data suppression” and it was designed by Colorado Education Officials with the intent of protecting student privacy. It’s an important concern we share, but Colorado’s implementation of data suppression rules has become among the country’s most onerous and limiting. It is becoming difficult to identify the academic performance of diverse subgroups at certain districts and schools, which makes it impossible to know how large the achievement gaps are in those areas and if they are improving. Student privacy and systems-level transparency don’t have to be in conflict. For schools and communities to have critical conversations about student performance and the gaps that exist, data must be made publicly available while also safeguarding student identity. We’re working with the state to reconcile these issues. The state data that is available shows that there are schools and districts who are closing, and even reversing, Colorado’s achievement gap. We should support efforts to learn from these success stories and encourage the scaling of best practices. The Succeeds Prize will support schools, educators, and education policymakers in doing so. At the same time, we know that, while many of the themes that undergird successful practices apply across settings, local solutions necessarily vary. By empowering local leaders, through formal means such as innovation zones, and less formal means, our education system is more likely meet the needs of our most disadvantaged students. Lastly, business leaders should continue to support policies and initiatives that support educational equity. We cannot lower the bar for student achievement because of a student’s life circumstances. An education experience that works for all Coloradans demands we fight for a system that benefits children of every background.